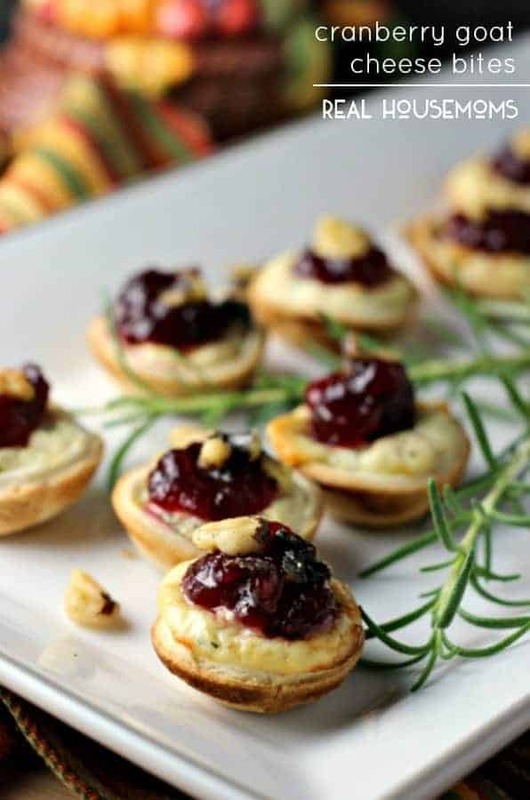 CRANBERRY GOAT CHEESE BITES are perfect little appetizers for your Thanksgiving spread! 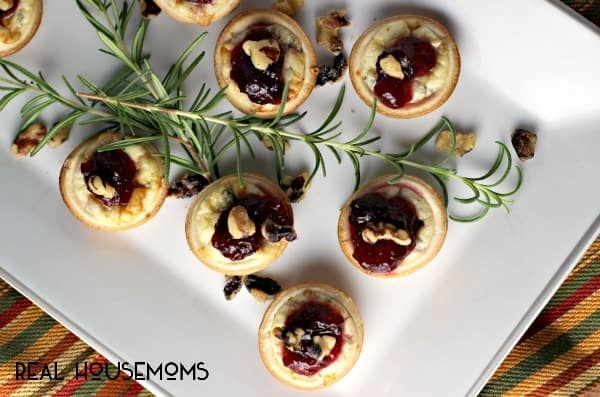 A savory “cheesecake’ filling is nestled in store-bought, refrigerated pie crust cups and topped with a sweet cranberry topping for a sweet and savory taste sensation. Are you a fan of sweet and savory? If you answered “yes,” than this recipe is for you and it gets bonus points because it’s really easy to make too! It starts with boxed, refrigerated pie crust, cut into small circles and pressed into a mini muffin pan. The filling is a savory cheesecake filling made from chive and onion cream cheese spread that is topped with a bit of creamy goat cheese and baked until set. Once cooled, sweet cranberry sauce is placed on top of the mini cheesecake and it is finished with a walnut piece! A really easy and elegant little appetizer perfect for the holidays! I am planning on putting these little gems on my Thanksgiving menu this year. I know my family will love them! I think these appetizers would be great for any holiday celebration! They are not only delicious, but they are also so pretty! I used canned whole cranberry sauce in this recipe, because fresh cranberries had not yet come to my grocery store yet. You can used the canned berries too, or make your own with using this Easy Apple Cranberry Sauce recipe! I think homemade is always better than canned. Get more great recipes like this one on our Real Housemoms Best Appetizer Recipes pin board! Follow Real Housemoms’s board Best Appetizer Recipes | RH on Pinterest. 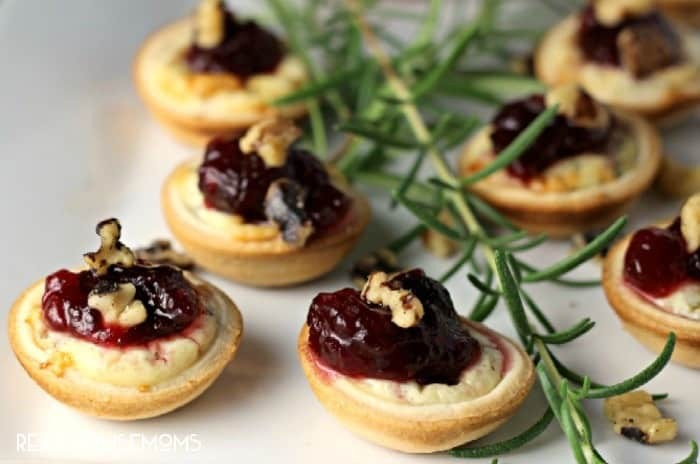 A savory "cheesecake' filling is nestled in store-bought, refrigerated pie crust cups and topped with a sweet cranberry topping for a sweet and savory taste sensation. Heat oven to 425 degrees F. Spray 24 cup mini muffin tin with cooking spray. Set aside. Unroll pie crusts. Cut 24 circles with a 2" cutter. Place one circle into each well of the mini muffin pan. In medium bowl, combine the cream cheese spread, egg, and salt and pepper. Spoon about 1 - 2 tsp. of cheesecake filling into each pie crust. Top each with some goat cheese. Bake in oven for 10 - 12 minutes, or until cheescakes are set. Allow to cool in pan for 5 minutes before removing. Top each cheesecake with about a tsp.cranberry sauce and then a walnut piece. Could these be frozen? And if so, how would you reheat…bake from frozen state or need to thaw first? Thanks!